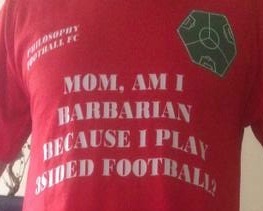 Excerpt of Ally Clow reports on one of Philosophy Football FC’s most extraordinary events yet. The post-match celebrations were relatively muted because, although the sweltering heat of the previous day hadn’t carried over, it was still very warm and everyone wearing a red shirt was thoroughly exhausted. After some photos, a lot of handshakes and some press and television interviews, Turkish artist Genco Gülan who presented the teams with their medals: bananas with the words “Golden Horn” written on their skins, a suitably Dadaist touch to remind everyone that they were, after all, here as part if the Istanbul Bienniale. From the pitch, we travelled to a nearby tavern and indulged in a large feast, watching as the locals ordered a yard of meat on a skewer and baked roasted lamb cooked inside a salt crust that had to be opened with a crowbar. Our hosts Thomas and Sabine invited the three teams back to their apartment near Taksim Square and Gezi Park, the root of the initial protests in June when the government revealed they were going to build a shopping mall on the park. Thomas and Sabine were incredible hosts: nothing was too much trouble for them and they showed genuine warmth toward us and seemed to think the day was a great success. Their apartment was a wonder and overlooked the Bosphorous that separates the European side of Istanbul from the Asian side and it was a wonderful evening. Some of the Turks wanted to know where ‘Wayne Rooney’ (ie Henry) was and joked that he had something against their country because he only seemed to score into their goal. Later on at around 11.30pm the cartoonist and animator Tan Cemal Genc, who had created the wonderful animated ‘trailer’ for the match, enquired if anyone wanted to go out to a bar. We all said yes and after many long farewells to our hosts, we left. Tan took us to Taksim Square. Even setting foot on the square was a powerful experience, knowing that part of the reason for our visit was the events that had unfolded there over the last few months. It was also intriguing because the idea of playing our match on the square itself had been mooted at several points in recent weeks, but the general consensus was that it would have been too dangerous because the police were watching the square for any subversive activity. The likelihood was the match would be stopped very quickly and further action may be taken. We stepped foot on the square and walked up to a central section slightly higher than its borders, lamenting that, although the match had been fantastic, it would have been an incredible experience to hold the match here. I don’t know who it was who asked if anyone had a ball, but Henry produced the match ball and we started to kick the it around between us. Watching this, Mark moved some of our kit bags around to create six goalposts, roughly equidistant from each other – and we all knew what was about to happen. 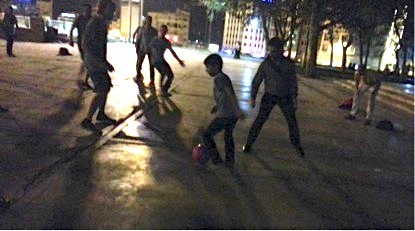 There was an undeniable excitement running through us all, a true shared experience that was exhilarating; could we get away with playing a 3sided football match on the site of the recent Turkish protests? We played for 5 minutes or so, attracting some bemused looks from the locals, but eventually some asked to join in. To start with, two men in their early twenties, then two boys of about 11 or 12, and all were clearly loving being part of something so spontaneous and unexpected. They also soon realised they could pass to another team and one of the young boys realised that it would be fun to receive a pass from someone then directly attack their goal. This was 3sided football as pure as it gets, spontaneous and peaceful yet retaining the concepts of collaboration and deviance in the pursuit of victory. Mark called for the end of the first rotation, the structure of a complete game had been created and while scores were kept, no one really cared about the result. For about 40 minutes that night, football’s most powerful force was spontaneously recreated: the power to bring pure joy to people. 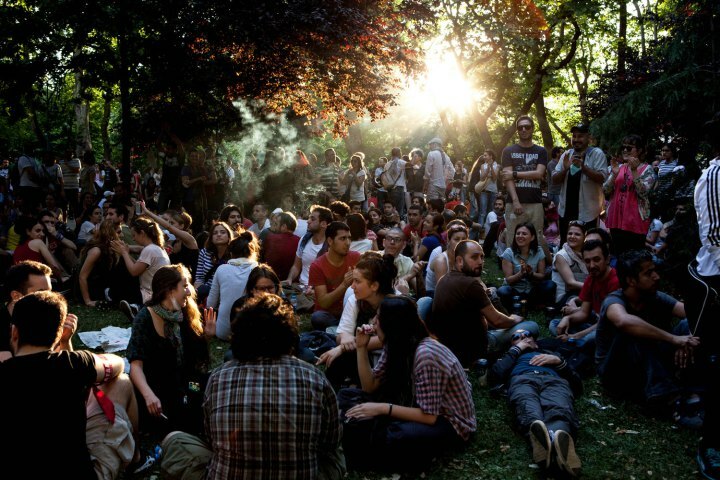 It was joyful for us because we were playing in the most symbolically potent area connected to the popular protests in Istanbul, and we were also gaining pleasure from seeing how happy it was making the locals who were taking part and watching. After the match, we gave the local men the remaining red ‘Barbarian’ shirts, one of them demanding Ally’s match shirt, sweat and all. It was awesome and inspiring. 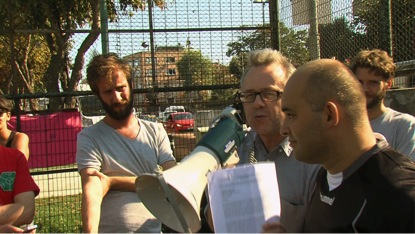 While we were playing, an old man walked across the ‘pitch’, smelled the air and said ‘I smell freedom here’.